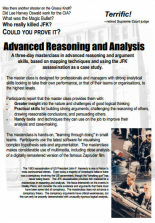 Our premium workshop in advanced analytic skills using a mapping-based approach runs over three days and takes the JFK assassination as an in-depth case study. Participants carefully dissect the core arguments for a conspiracy of some kind, and through sustained, rigorous investigation come to a much better appreciation of what really happened. Along the way, their understanding and skills in critical thinking are lifted to a whole new level. "YES. This was a fantastic course and I learnt so much. A good combination of theory and practice; the JFK case enables us to access this (relatively dry) theory in a dramatic way. Not having done much similar work, it was great to do something challenging!" "The workshop in fact exceeded expectations. I was prepared for the latest 'fad' in management tools, but was pleasantly surprised to find it relevant and digging deep into core principles. As a lawyer, my job involves 'thinking' all the time. This course emphasised for me the importance of not taking short cuts in the reasoning process, but always to go back to the foundations of why I believe something. This will help in convincing others (clients and courts) as to the reasonableness of my position." The workshop was well-organised, thought-provoking, and compelling. It was challenging and enjoyable to participate…I am a manager of a team of delegates who consider claims lodged under the Veterans' Entitlements Act. Delegates are required to consider a large amount of documentary evidence, often conflicting, in order to make a decision. They need to be able to argue their conclusions clearly and in a way that reflects the law. A huge part of my work involves guidance in the consideration of evidence, the weight that can be given to certain types of evidence, and the writing of reasons for decision. This course helped in the acquisition of new skills and the development of existing skills relevant to my work. "Overwhelming asset to my work and appreciate the time and effort the convenors gave to the participants." "This is undoubtedly the best and most useful course I have ever attended. I can see the usefulness of this process in all manner of work situations; particularly brief preparation." "The workshop was very beneficial to me personally and in my work role." "A great theoretical base for producing an argument...assists in examining the way we think/react which is important in our profession." "Enjoyed all of it. I would recommend the workshop to colleagues to ensure they experience the same expansion of horizon and "eureka" moments." "While challenging at times, it has opened my eyes to a different approach to looking at problems and displaying arguments." "The JFK case study was fascinating and I enjoyed pulling this apart in various hypotheses, arguments, assumptions etc. 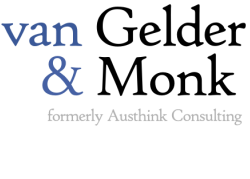 It challenged my thinking and preconceptions... Tim and Paul did a great job and made this workshop interesting and informative." "Very useful ideas and a well-constructed/presented course." "Would definitely recommend! Intellectually rigorous course with use of excellent course material, software & technical equipment."